Matt Westmoreland joins an NBC Education Teacher Town Hall on Sunday. He appeared in part 1 of the two-hour panel on May 6. 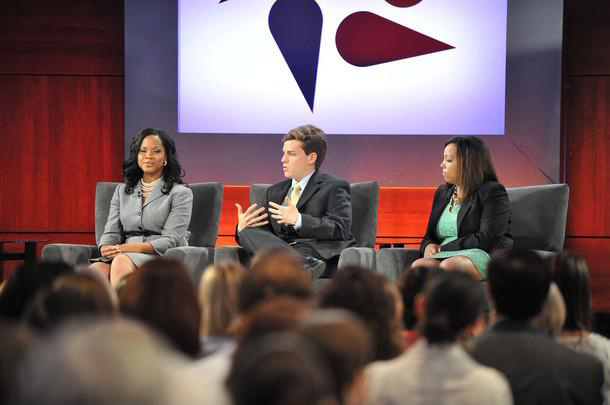 Elisha Gray (Jackson HS), Matt Westmoreland (Carver Early College HS) and Claudia Varela (KIPP WAYS Academy) join 300 other teachers joins an NBC Education Teacher Town Hall on Sunday. He appeared in part 1 of the two-hour panel on May 6. FRONT AND CENTER: Southerner and Grady alum Matt Westmoreland, a distinguished teacher at Carver Early College High School, joined fellow teacher panelists Elisha Gray and Claudia Varela to lead a discussion of 300 Atlanta area teachers in a Teacher Town Hall discussion sponsored by NBC Education Nation. The town hall meeting aired live on Channel 11 television and was broadcast live on the NBC Education Nation website on Sunday May 6. If you missed it, click on the picture to see and hear part one of the town hall discussion.